Asparagus is the tastiest spring veggie, and we all love it in our green salads. When it is in season, asparagus is super crunchy and high in nutrients. According to experts, nutrients in asparagus can affect insulin levels in the human body, which means that this vegetable can be used in the treatment of diabetes. Maintaining proper insulin levels is one of the most important health principles that provide optimal wellbeing. It prolongs life and makes us feel great. Asparagus is also an excellent diuretic, due to its mineral content. Given that it is a natural diuretic, asparagus stimulates kidney function, and enhances general detoxification and purifying. It is in the same group with other veggies that contain insulin, and this is absolutely great for the friendly bacteria in your intestines. Considering this, asparagus provides a normal digestive function and takes care of your belly. Folate in asparagus is essential for pre-conception and early months of pregnancy. Essential minerals in asparagus lower the risk of birth defects and support the development of the nervous system in babies. You can grow your asparagus using root crowns or seeds. Farmers usually prefer the crown, since it gives tons of seeds. Tiny seeds germinate within 3 weeks. 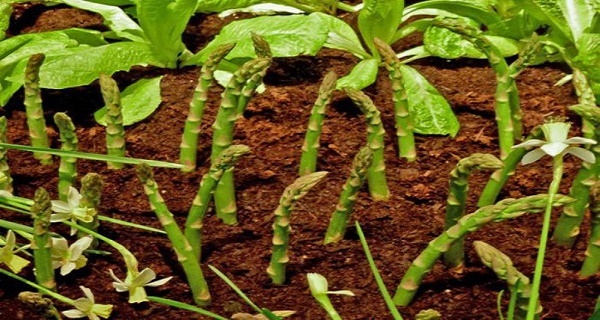 Asparagus likes full sun exposure and you can grow it everywhere. Consider providing good drainage system and light soil. Get your trench ready, and make sure it is 12 inches wide and 6 inches deep. Mound the soil in the middle part of the trench, and set your crowns on top. The crowns should be 12-8 inches apart, and the row 4’. Fill up the trench with light soil, keeping in mind that the crowns should be 2 inches deep. Gradually add the soil until it is slightly mounded right around the very base of your asparagus.